This is my last day for the season and it looks like being a bit of a fizzer. The forecast is for rain all day and the track is a deteriorating DEAD 4. I’m just going along for the colour and movement. Besides, it gets me out of the house. A bet seems pretty unlikely. I’ve been scared off from the last three mid-weekers because of the HEAVY 8. So my season is petering out. And as soon as I step onto the course the track is downgraded to SLOW 6. This is the way the world ends, not with a bang but a whimper. In the first race the two-year-olds run a time of 72.55. The late and great EJ Minnis’s par time for a genuine DEAD track is 72.62, so that’s quite reasonable. And you’d expect that first use of the track is likely to produce a better time before it gets all chopped up. In the second race, the good thing Our Baby Bonus, runs 59.88 compared with EJ’s par of 59.83 for a genuine DEAD. Again, not too bad. In the third I’m quite taken with the appearance of Stoneblack, but hold back. The horse nearly wins with a terrific run, with a race time of 98.01. EJ’s par times rate that as a GOOD track! I coulda backed that horse! $2.90 the place. Damn! 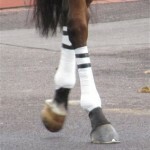 I miss the fourth, a 3000 metre race for plodders, and fool around photographing cannon bandages. I still don’t like them and they are still a serious negative. But at least they provide some colour and movement. In the fifth, only seven horses. But I’ve now decided that the track is bettable, it hasn’t rained all day, it’s my last day, and I’m going for it. Tindal looks terrific with his two strappers and I go for him. He hangs on to win in 97.72. The track is still GOOD and I’m up and running with $3.30 for the place. In the sixth I can’t split El Mandon and Gran Sasso, so I leave it. The time of 71.75 is a GOOD/DEAD time. And in the last Elumino is faultless in the yard and showing $2.90 the place on the tote and $1.55 with the books with five minutes to go. I know it will be crunched but I back it on the tote at $1.80 with one minute left. Elumino ducks along the rail for third and I get $1.60. And the time for the last? A SLOW 60.33. It’s all too late now to stop betting! Three out of three for the day. It’s nice to go out with a bang. 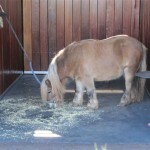 I’m off to the spelling paddock now and will return in the spring. Hopefully I’ll find time to send a few postcards from the paddock. I’m feeling fairly average. In fact , I’m quite ordinary. Well, really, I’m a bit poorly. My head is full of germs. But there is no point staying at home moaning about it, so I’m off to Caulfield to share the germs around. I’m stuffed full of cold and flu tablets, but they hardly seem to make an impression on an insistent, dull headache. And the congestion in my ears and nose seems to amplify my tinnitus, so that it sounds like the entire Melbourne Symphony Orchestra is tuning up inside my brain. It’s so noisy in there that I can’t even think. It looks like a dangerous day for decision making. And it doesn’t start too well. The omen bet Pray for Me is a standout in the second. 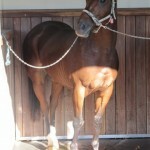 No faults, perfectly behaved, head in towards the strapper. I have crossed out all the other horses, so I double my bet. The horse has a perfect, faultless run with cover, but just fails to hold on for third. Oh well. In the third I don’t like the favourite War Ends, mainly because it was tossing its head around repetitively out the back. I offer to lay it for the place at $1.40 on my betting instrument, but the bet goes unmatched. The favourite weakens to run fourth. Oh well. In the fifth race Patrick Payne’s Fieldmaster looks the goods, with a nice positive strapper. The horse has the race shot to bits but is just nosed out on the line. It’s times like these that I’m glad I’m a place punter! Thank goodness. Back to square one. One more roll of the dice in the last. Das Machen and Delyara both look good, and I settle on Das Machen. She leads from pillar to post with Delyara running a very good third at $5.90. But I happy with my $2.80 and two out of three for the day. My long term average. And I’m still feeling quite average. Home to bed to nurse my poor sore head. I’m only here for five races today. As unlikely as it sounds, sometimes other events take precedence in your life over horse racing. Today is such a day. 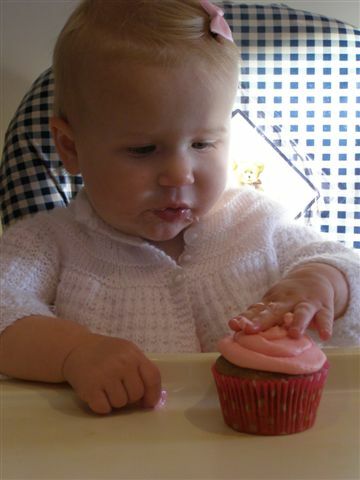 I have to go to a birthday party – and I love parties! Of the five races I only manage to look at the horses in three. 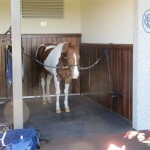 I miss one race trying to photograph Golden Tabby’s marvellous stereotypy, smacking his lips. But the movie function on my camera won’t work properly. I later discover that the “M” setting on the camera means manual, not movie! And I miss another race talking to Ken Fythe, the Stony Creek trainer of Rockpecker. Apparently the stewards listen to Radio 927 and quizzed him about an injury to his horse, and then broadcast the details over the course PA. Important information really – now that you can lay horses. Lloyd Williams’ imported Cup horses are on show in the sprint race. They both look very good in the mounting yard, led by the usual two strappers. Mourayan is the smaller and lighter of the two, and Alandi, the dual Group 1 winner, is stocky and solid with a deep chest – plenty of room for a large heart! They are very similar in appearance. Both of them are dark bay or brown in colour, with Mourayan more bay and Alandi more brown. 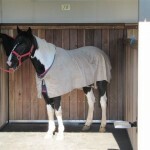 And both of them have similar white facial markings – a star and strip – despite having different sires. I couldn’t fault their behaviour. They finish down the track, barely beating the ambulance home, as you would expect for 80/1 chances. But watch out for them in the spring! In the end, I didn’t even have a bet. But the party was good. Happy Birthday Amy! Now we are one! I’m a bit fearful as there has been rain about overnight and I’m not allowed to bet on Slow tracks. And apparently they have been putting water on the track as well. I hate that – why can’t they just leave it be! The track is rated a Dead 4 but the word from the jockeys is that it’s at least a Dead 5. I check my par times for a Slow track at Flemington compiled by the late and great EJ Minnis and find a figure of 85.95 seconds for 1400 metres. In the first race they run a time of 86.26 for 1410 metres. If I allow 0.5 seconds for the extra distance of 10 metres it still looks like a Slow 6 track. CAUTION!! DO NOT BET!! But in the third race I’m still quite keen to back The Comedian, very relaxed, head in towards the strapper. And the favourite Undeniably looks a risk, a bit sweaty and bulky. There’s a fall in the race. Luckily The Comedian misses the trouble but he gives up in the straight and compounds quickly to finish seventh. What a joke! He couldn’t pick up his feet! Whenever I lose I look for someone or something to blame apart from myself, and in this case it is quite clear that the track is at fault. I had better shut up shop! I probably should have laid the favourite who finished ninth at $1.10 the place. The punter’s lament – should’ve, should’ve. What to do at the races when your hands are tied? Photograph some horses, of course. And today everywhere I look I see a pony. A plethora of ponies. When I wrote Watching Racehorses it was quite uncommon to see a pony. 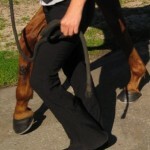 Of the more than 10,000 horses that I observed only 176 were accompanied by a pony, about one every meeting. It was the most positive of all the variables that I scored. Now that everyone has read the book they all bring a pony to the races, and the advantage, while still positive, has been much reduced. Today I saw nine ponies. Two could not be identified because they were occupying the wrong stall and three were over 14 hands, and didn’t fit in the photo, and so should really be called horses. Here are the best six. And the winner is …… Golden Charmer, don’t you think? How could you resist it? I broke all my rules and backed it for a place on the tote at $2.70. I watched the race on the TV and the horse was so far behind the first and second horses that it was out of the picture when they hit the line. But it survived for third. And the final result for the seven horses identified with ponies was two placings and five unplaced runs. Not too bad, but not what it once was. 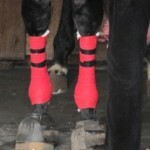 My mission today, should I decide to accept it, is to photograph Tesbury Jack’s splint on his nearside foreleg. 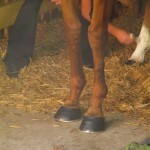 Splint bones are the remnants of pre-historic toes and run down either side of the cannon in the horse. 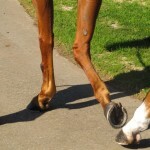 They can get bumped or knocked and the area can become inflamed and swollen, but will heal with time. 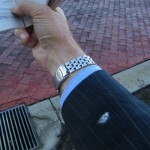 Often cannon bandages can conceal them, but Jack’s is on full view. It’s tricky to photograph when he is moving, but here are a couple of attempts. 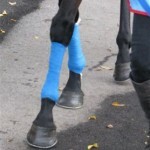 It looks to be a “cold” splint as Tesbury Jack does not appear to be in pain or lame. Wikipedia has a good account of splints if you are interested in more. 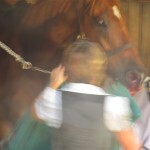 The horse is unhappy in the mounting yard and very fractious, with his ears back and grabbed by the clerk. He’s not worth laying at $6.80 for the place and drops out of the race to finish last. On return to scale he’s bleeding from both nostrils. 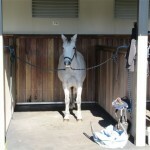 Back in his stall he’s a sorry sight. This is his second conviction for bleeding so he’s now banned from racing in Australia. A sad end for a terrific racehorse. On a more positive note I was shat on from a great height by a flying swallow. I checked with all and sundry and confirmed that it is a sign of immense good fortune if you are struck by avian excreta whilst at the racetrack. And so it proved. 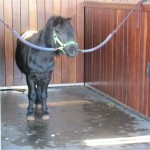 I successfully layed Johansky for the place as she was not at all happy in her stall and let out an almighty groan. The strapper asked the horse “What’s the matter?” Of course, the horse did not reply, but I always interpret groaning as meaning that the horse would rather be somewhere else. Much like a teenager. So, I decided to oppose it for the place at $1.90. During the run Johanski dropped to the rear, as I expected, but ran on quite well for fourth. And I backed Broken at $2.20 the place because of the positive strapper – with one hand stroking the horse’s withers all the way round the mounting yard. Broken dived through on the rail for a strong win. Bring on more swallows.